Life isn’t for the faint of heart in the outback. From dry land to the murkiest of waters, it seems as if there is some kind of creature with superpowers that’s out to get the Aussies at every turn they make. If that in itself isn’t enough, you’ll also find half-crazed lunatics who hunt other human beings and not to mention, the natural elements alone have the power to kill. Luckily, the Aussies are seemingly scrappy enough to be able to care of themselves. Worse case scenario, they might end up rough-housing a baby crocodile and have to chuck a sickie, so we will consider this list a warning guide for the people who don’t live in Australia and are just looking to keep it handy in case someone tries talking them into coming along on an outback adventure. We would hate for anyone to considers us to be whiners, but personally speaking, we’d much rather be able to enjoy seeing the late arvo sun for several more decades to come! We hope that you’ll find this list to be a ripper time in any case! It’s chockers full of intriguing yet horrifying items that all add up to one big death trap. If you dare mate, give it a read. There’s such thing as a predatory sea snail? Yep, this one is venomous and comes loaded with its own harpoons, that is what the tiny pipette looking poison tubes are really called. The marble cone snail’s harpoon is used as a hypodermic needle that is disposable and reaches out from its cone, striking a victim before falling off. Marble cone snails are primarily known for targeting small sea life, but they can also cause damage, and possibly severe damage to human beings if they ever feel as if they’re being threatened so they shouldn’t ever be handled. The killer snail normally has around twenty harpoons in storage, ready for use at any given time, so literally, it is always locked and loaded. 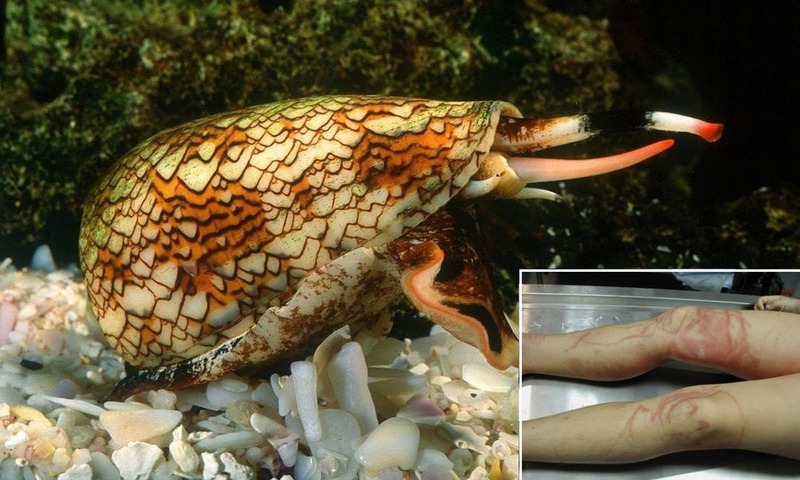 The marble cone snail’s harpoon is filled with a poison cocktail that sends anything that comes in its way into something known as exitotoxic shock initially, and then into a state of flaccid paralysis. This all seems quite unfair, considering the fish will never see this coming since the harpoon has the ability to easily strike from a distance away. But that is just how the thug slug works under the sea.